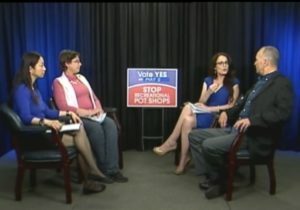 On air today on Sharon Community TV (SCTV) I hosted a panel discussing the importance of voting yes to ban recreational marijuana shops. Each panelist provided through their lens of expertise, factual information to the public as to why voting yes to the ban is absolutely the decision urged. We provided our viewers with the information that on Tuesday May 8th at 7pm at the Sharon High School gym 66% of those in attendance must vote yes to ban recreational marijuana shops here in our town of Sharon, otherwise, it is coming…. Therefore, every vote counts. If you are interested in viewing our 30 minute informative panel discussion program to learn more, it airs daily starting today leading up to voting day & beyond on local Sharon TV Channel 8 (check what times on SCTV website). 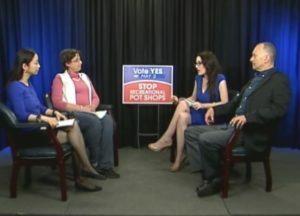 Or, view now: Dr. Karen Ruskin & Panel: Vote Yes To Ban Recreational Marijuana Shops. Below in this blog you will find the following: panelists information, a summary of a few of the points explored on air, and links to various videos and articles to learn facts and details about Marijuana so that you can be ‘in the know’ with evidence based research and factual information rather than simply having emotional based bias that is far too often posted on social media. Explanation of all four articles that are up for voting as summarized by Connie (as there’s been much reported confusion in town), as well as explaining why voting on May 8th is so imperative, and if the ban does not occur, the voting that will take place on May 15th. Real life account and patterns observed through J.J.’s lens of when he was a narcotics officer, of the role marijuana played in problematic behavior of the youth population and concerning family dynamic issues. 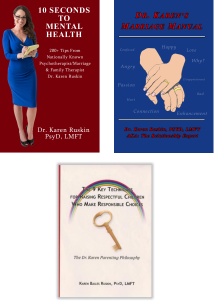 Concerning facts about Marijuana use explained by Dr. Karen Ruskin (e.g., mental health issues, social conformity vs. teaching our kids to be leaders not allowing the collective group to make decisions for us, addiction/diagnosis, dependency, negative medical health effects, negative societal effects, driving accidents). The Federal and State governments ongoing disagreement, and the significance of that fact explained by Jill. Additionally Jill provided the most up to date mandates in the school system in our changing time due to Marijuana, and how our youth are affected. (Additional points check out comprehensive one sheet, side picture). 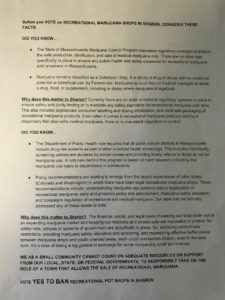 The negative impact a recreational shop would have on Sharon including it’s health, public safety, and reputation as stated by Dr. Heather Boxerman. Included in Dr. Boxerman’s stance/statement is that marijuana is a gateway drug causing further addictions to drugs such as heroin and cocaine, proven to lower one’s IQ, trigger psychiatric illness, and associated with reckless driving and an increase in motor vehicle accidents. To date our neighboring towns in Norwood, Walpole, Foxboro and Stoughton banned recreational marijuana shops. Recreational marijuana and recreational marijuana shops is a critical public health issue effecting us as individuals, our children, our family, our neighbors, our town, our community, surrounding towns, our country – in a wide variety of ways. Each panelist cares about Sharon. Additionally we each have in common with one another that we work and/or reside in Sharon, and all our children either currently are or have gone through the Sharon school system. A big thank you to each panelist for taking the time to provide education to our community. A big thank you to all of those in the community behind the scenes taking part in playing a role in spreading the word. A big thank you to Sharon Community TV’s team for pulling together a slot for our show at the last minute with fast turn around time. Ghosh, T. S., Vigil, D. I., Maffey, A., Tolliver, R., Van Dyke, M., Kattari, L., … & Wolk, L. (2017). Lessons learned after three years of legalized, recreational marijuana: The Colorado experience. Preventive medicine, 104, 4-6. Increase in hospitalizations with marijuana-related codes by 70% between 2013 and 2015 (CDPHE, 2016). State Patrol data for the first 10 months of 2016 show that DUI’s where marijuana was noted as an impairing substance were 16% higher than the same period in 2014 (Colorado State Patrol, 2016). Fatalities where the driver tested positive for cannabinoids increased by 80% between 2013 (55) and 2015 (99) (Colorado Department of Transportation, 2016). Calls for children 0–8 increased 63% in the first year after legalization from the Poison Center Data (Ghosh et al., 2017). Colorado has a campaign targeting pregnant and breastfeeding women which has generated 4–6 5 million impressions in its first five months (Colorado Department of Public Health and Environment, 2016h). Berg, C. J., Henriksen, L., Cavazos-Rehg, P., Haardoerfer, R., & Freisthler, B. (2018). The emerging marijuana retail environment: Key lessons learned from tobacco and alcohol retail research. Addictive behaviors. Greater density of medical marijuana dispensaries in 50 midsize California cities was associated with higher odds of past-month use and greater frequency of use among adults (Freisthler & Gruenewald, 2014). Neighborhoods having medical marijuana dispensaries had a 6.8% increase in the number of marijuana hospitalizations with a marijuana abuse/dependence code (Mair, Freisthler, Ponicki, & Gaidus, 2015). Collectively, this literature suggests that spatial access to tobacco and alcohol retailers and exposure to the widespread marketing these sites contain may contribute to substance use and disparities in patterns of use. Drug retailers are disproportionately located in neighborhoods characterized by socioeconomic disadvantage and higher proportions of racial/ethnic minorities, and that retail marketing diﬀers by neighborhood demography. Endsley, P., Embrey, M. L., & National Association of School Nurses, (NASN) (2014). Marijuana and Children. Position Statement. NASN supports smoking marijuana for medicinal use is not recommended for children. NASN recognizes that marijuana made available for adult recreational use poses the potential for increased prevalence and abuse potential among youth. There are well‐documented, serious cognitive effects; health implications; and safety concerns of recreational marijuana use. NASN concludes that the legal availability of marijuana presents more accessibility to the student population and, therefore, puts students at higher risk of use and health consequences. Previous post: Social Media – Healthy Debate or Hurtful Personal Attacks?